Source: CVWM Photo of Percy Carthy – In memory of the men and women from the Waterloo area who went to war and did not come home. From the booklet, Peace Souvenir – Activities of Waterloo County in the Great War 1914 – 1918. From the Toronto Public Library collection. Submitted for the project, Operation: Picture Me. 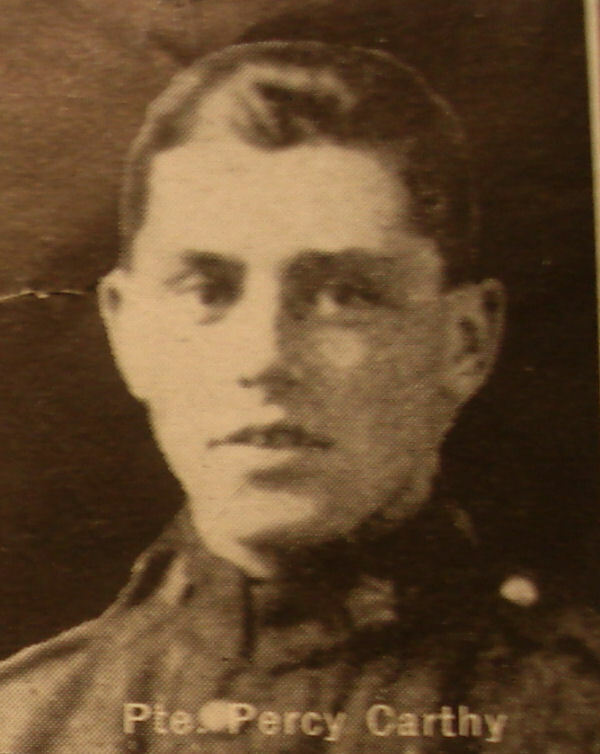 Older brother to Private Eric Carthy who, was himself, killed in action first on September 16, 1915. “‘To Avenge his death.’ Great War tears a family, city apart” by Jeff Outhit, The Record, Kitchener, Ontario. Published December 26, 2015. Joseph and Harriet [Percy Carthy’s parents] have their hearts broken again. A stranger writes to them in sorrow from Woodstock. She explains that her brother and Percy were pals at the Belgian front. Her brother was badly wounded there in January 1916, not long after Eric was killed. Percy told her brother about how hard it was to lose Eric. When her brother was wounded, Percy helped shield him from further harm, throwing himself across his body to protect him from a bursting shell. The woman tells Joseph and Harriet that her brother, recovering uncertainly in England, speaks often and fondly of Percy. His family has not told him the sad news to spare him the shock. Outhit, J. (2016). ‘To avenge his death.’ Great War tears a family, city apart. [online] Therecord.com. Available at: http://www.therecord.com/news-story/6209663–to-avenge-his-death-great-war-tears-a-family-city-apart/ [Accessed 1 Jan. 2016]. ” Percy was born in Ashton-under-Lyne, England on October 9, 1894. 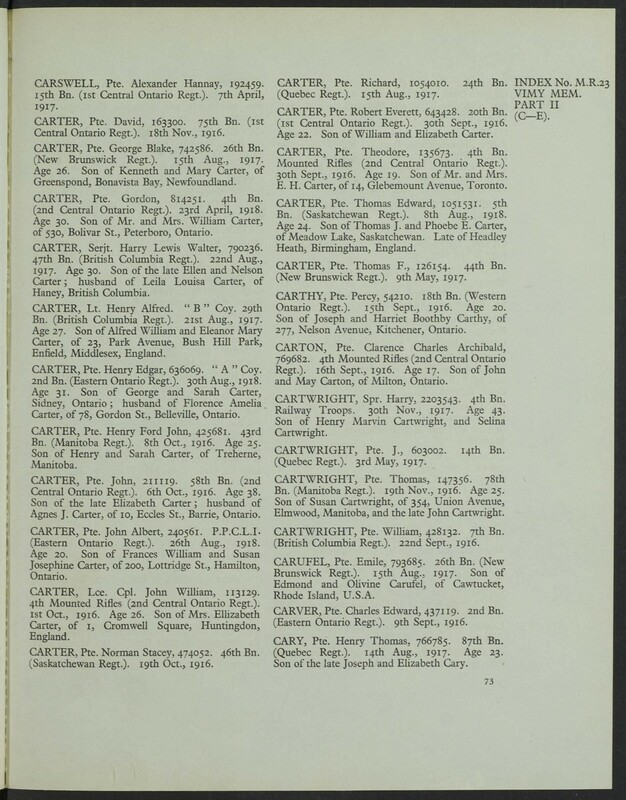 He was the son of Joesph and Harriet Boothby Carthy, who, at the time of his enlistment, lived at 39 Waterloo Street, Berlin, Ontario, later 277 Nelson Avenue, Kitchener. He listed his occupation as labourer. He enlisted January 25, 1915, three days after his younger brother. Percy was connected to the 18th Battalion of the Western Ontario Regiment. 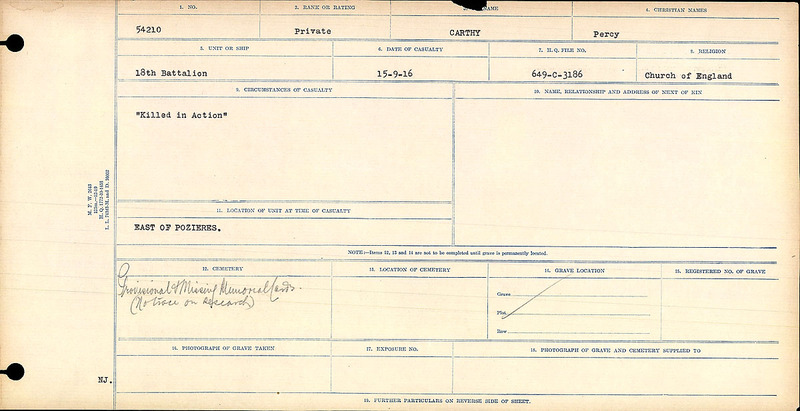 He went overseas in April 1915 and to the front on September 16, 1915. He sustained gunshot wounds in the eye and leg on June 7, 1916. He was killed in action on September 15, 1916 at the age of 21. Source: A Book of Remembrance: Members of the Church of St. John the Evangelist, Kitchener, Ontario.